Noticed any unwanted activity in you attic? Don’t let pests damage your home, or threaten the health of your family. 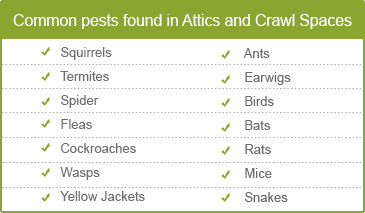 In order to protect your property from infestations, your attic or crawl space must be regularly inspected and maintained. At Quartz Solutions, we are the leaders when it comes to Attic & Crawl space solutions. Equipped with state-of-the-art technology and experienced work force, our team will identify the problem and offer you a catered solution for competitive rates. Leaking and dripping ducts impair the insulation capacity; inflating your energy bills. Insects such as wasps, cockroaches and termites can harm humans. They also damage the insulation and structure itself. Animals, such as rats and bats, damage wiring and insulation. Mold and mildew thrive on excessive moisture;rotting away the wood and the building’s structure. Careful assessment of the Attic & Crawl space will help unfold the existing and looming problems. Our experts will visit your property at your convenience, free of charge. After we inspect the property, we will outline a game plan to solve your problem quickly and efficiently. We offer the best services in the industry – at the most competitive prices with no hidden costs. Located alongside the Hudson River, Englewood is considered to be a small city in Bergen County, NJ. With that said, it is known for its beautiful houses, vibrant community, and amenities such as: a pool, gardens and athletic fields. Englewood is breathtaking in every way. We at Quartz Solutions, aim to further Englewood’s beauty by offering everyone quality service, at a reasonable price. 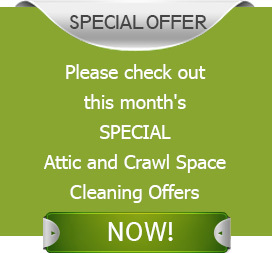 Let us be your choice for Attic & Crawl space work. Simply give Quartz Solutions a call 201-205-2042 and let our team take care of the rest. We will inspect your home for free and offer a detailed plan to suit your needs.